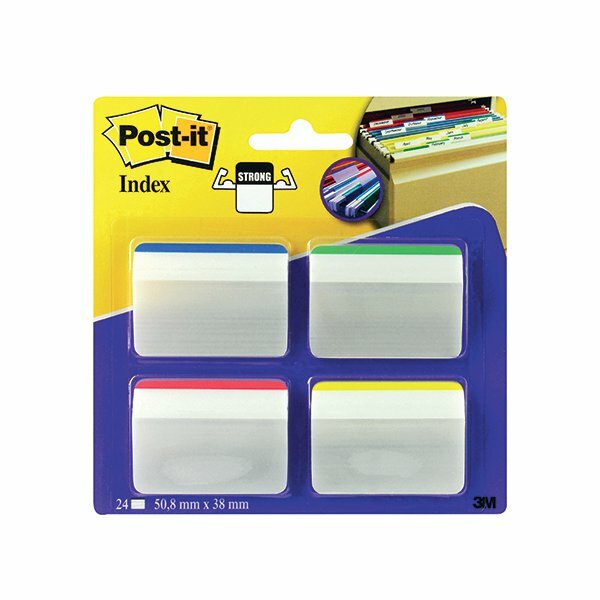 • Ideal for labelling and colour-coding files. • Six durable tabs per colour, 24 in total. • Assorted pack of red, yellow, blue, and green tabs. 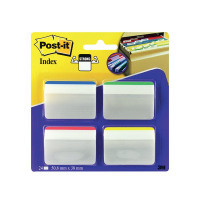 These Post-it Index Angled Filing Tabs provide an easy way to mark and highlight important information in an instant. With Post-it removable adhesive, you can easily apply, remove and readjust the index tabs as necessary, whether you're highlighting parts of a document or marking relevant pages in a book. The extra large tabs measure 50.6 x 38mm (2 x 1.5 inch), providing a larger area to write on and are angled for easy reference. The durable, extra thick tabs are designed for long lasting use. This pack contains 24 index tabs with blue, yellow, red and green coloured tips.